Check out Green Mart at shop.bt, a new online grocery shop in Thimphu. You register, select the items, add them to the virtual cart, and then check out. You can order anytime. Delivery is done 7 days a week, either during lunch break (1-2pm) or in the evening (5-8pm). These time slots are convenient. There's no minimum order, and the delivery fee is Nu 50 in Thimphu proper and Nu 70 in extended areas. Given the current taxi fares, the shipping fee is very reasonable. And best -- you pay cash on delivery. They were good while they lasted. 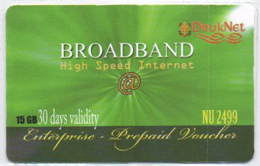 But apparently Bhutan Telecom's broadband recharge cards are no longer available. These cards had the great advantage of saving a trip to the BT office for customers using the prepaid broadband option. I guess all good things eventually come to an end. Impermanence. Should I check the "Stay signed in" box when I log into my Gmail account? Question of the Week My memory card looks like it doesn’t work. I am not able to open it, and it won’t even let me format it.